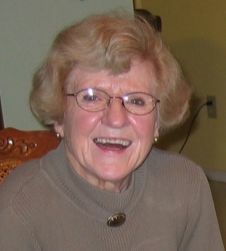 Sally Schroeder Isaak: teacher and radio broadcaster; born 19 February 1926 near St. Francois Xavier, Manitoba, Canada. She was the second of 10 children of Wilhelm Schroeder (1894-1975) and Sara (Doerksen) Schroeder (1896-1973), immigrants in 1925 from South Russia. Sally married Frank Isaak on 22 August 1987 at Steinbach, Manitoba. Sally died on 19 January 2009 in Abbotsford, British Columbia, Canada. The Wilhelm Schroeder family moved to an isolated farming community near Steinbach, Manitoba in 1930. This is where Sally spent her early childhood, where she went to Grade school and where her father Wilhelm Schroeder served the little community with his preaching in the local school house. After completing high school, Sally continued her education and upon graduating from Teacher’s College in Winnipeg became a school teacher. She also studied at Mennonite Brethren Bible College, Winnipeg, Manitoba; Regent College, Vancouver, British Columbia; Tabor College, Hillsboro, Kansas, and the Mennonite Brethren Biblical Seminary in Fresno, California. Sally began her teaching career at Kleefeld, Manitoba. After three years at her first school she resigned this position and accepted a teaching assignment at Winkler, Manitoba, where she became involved in church work, singing in the Mennonite Brethren church choir and teaching Sunday school. Sally worked for one year with Mennonite Central Committee in California and returned to Winnipeg and teaching for one year after that. From 1956 to 1987 Sally worked in the German Language Service of HCJB World Radio in Quito, Ecuador, with Mennonite Brethren Missions and Services International. While in Quito she was active in the local Spanish church. During that time Sally also earned a Masters degree in Communications from Wheaton Graduate School, Illinois, which honed her tools for good broadcasting. Although the letters from listeners, especially in South America, were positive and encouraging the programs beamed at German-speaking Europe were generally not as well received. Consequently Sally went to Germany in 1966 to spend several months living there to listen to, and interact with the listeners. The direct, honest criticism was perhaps painful at first but it provided insight, and programming was subsequently changed and tailored to meet the needs of the European radio audience. In 1987 Sally settled in Abbotsford, BC with her husband Frank Isaak where she joined the Bakerview Mennonite Brethren Church. Sally was fluent in German and English as well as Spanish so it was here that she began a new ministry with Latin Americans leading to the establishment of Bakerview Hispanic Church. Health problems, including diabetes, plagued Sally during her working years and cancer became a challenge in retirement. In spite of this her enthusiasm and energy, her spirit of good will and her unfaltering faith was an encouragement to all who knew her. Isaak, Frank. Interview by author. Abbotsford, BC (6 November 2009). Isaak, Sally Schroeder. Some Seed Fell on Good Ground. Winnipeg, MB: Windflower Communications, 1994. Mennonite Brethren Herald (July 2009). Schroeder, William. Interview by author (4, 7, 14 & 16 December 2009). Neufeld, John J. "Isaak, Sally Schroeder (1926-2009)." Global Anabaptist Mennonite Encyclopedia Online. December 2009. Web. 22 Apr 2019. http://gameo.org/index.php?title=Isaak,_Sally_Schroeder_(1926-2009)&oldid=142775. Neufeld, John J. (December 2009). Isaak, Sally Schroeder (1926-2009). Global Anabaptist Mennonite Encyclopedia Online. Retrieved 22 April 2019, from http://gameo.org/index.php?title=Isaak,_Sally_Schroeder_(1926-2009)&oldid=142775.